I’m back from Fire Island and still sorting through all of my photos and videos. I can’t wait to share some of them with you! I have posted a couple of snippets on Instagram and Facebook but I am waiting to debut the paintings in person during October’s First Friday Art Walk in Highlandtown at Night Owl Gallery. This was such an incredible experience where I learned a lot about myself and my creativity. I will definitely be applying what I have learned to my home-studio practice. I am about to embark on my first artist residency! I leave Monday. The residency will be from September 1 - September 15. My focus will be on painting to capture and interpret the changing weather and the affect it has on the landscape. I'm so excited for this opportunity to focus on this next phase of art-making. Two weeks of uninterrupted studio time at this point in my life I feel like I can accomplish a LOT. I am hoping to have lots of new work to share upon completion of the residency. I am also hoping to have time to write about the experience to be able to share that with anyone else considering doing something like this. 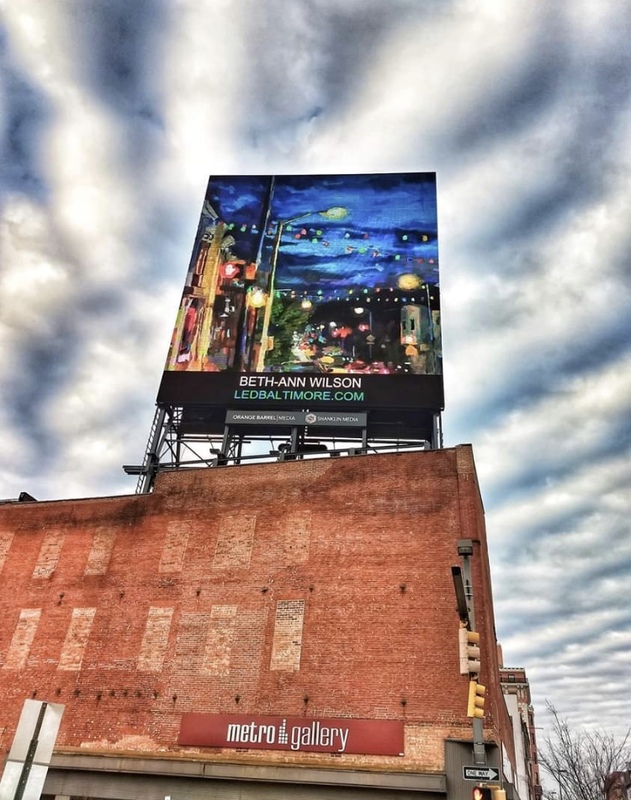 From talking to other folks in the artistic community, at least in Baltimore, a lot of individuals don't even know that these opportunities exist! 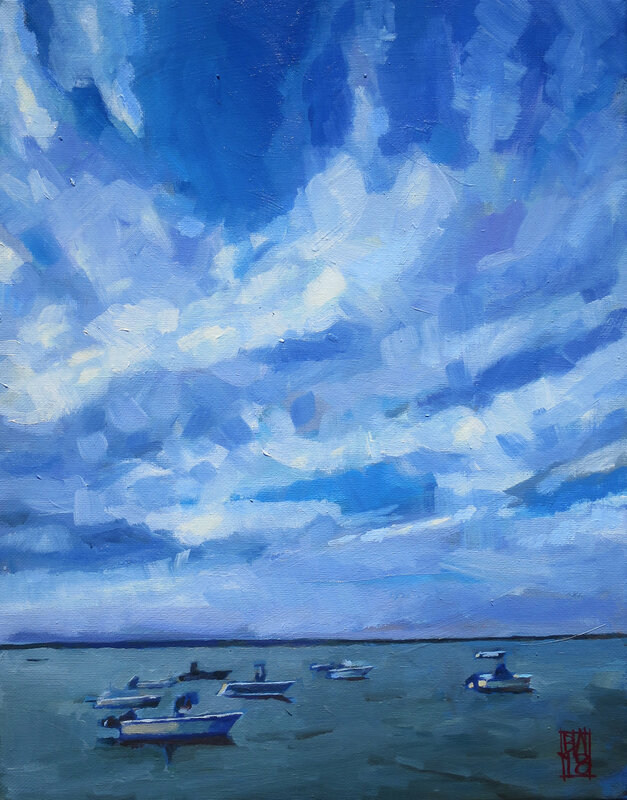 More information about the Artist-in-Residence Program at Fire Island National Seashore can be found at https://www.nps.gov/fiis/getinvolved/supportyourpark/artist-in-residence.htm. Thank You! I am so happy to have been chosen "Best Artist 2018" in Baltimore Magazine's Best of Baltimore Reader's Poll! What an honor! This past Thursday the 7th, there was yet another public painting event that I had pre-registered for. (Check out my last two blog posts to read about the events earlier in the week. 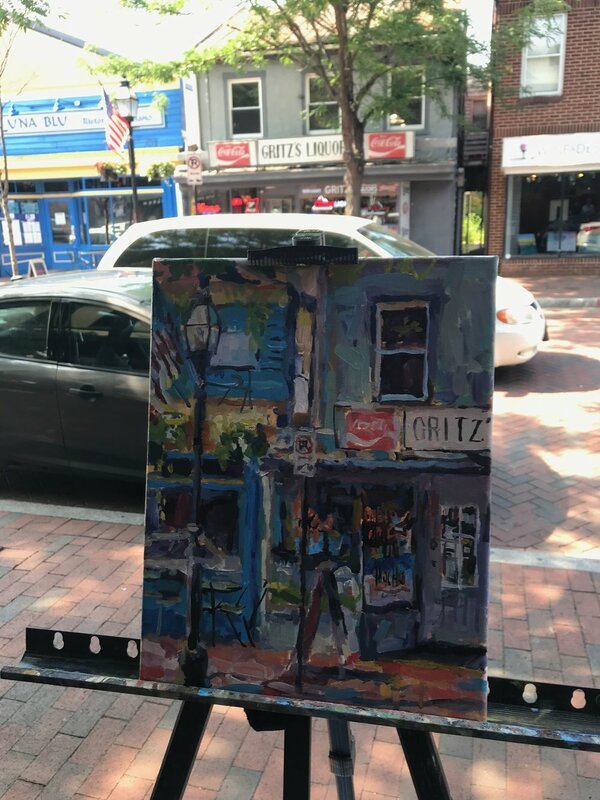 There were 3 public painting events at Paint Annapolis this year.) Luckily I had gotten Thursday's canvas stamped on Wednesday so I could drive back down to Annapolis and immediately scout a spot, knowing I was going to be bushed from the previous night's Nocturne. 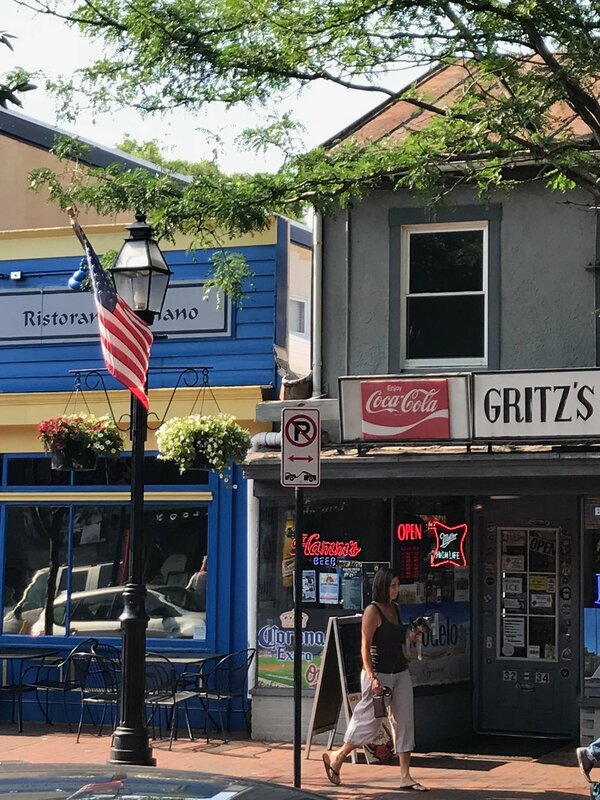 There was a much larger geographic area to choose from, but not knowing Annapolis very well, I tended to stay on the beaten path. Unfortunately, I think that is what everyone else decided to do because I could not find parking even for my tiny Prius-C. It was a gloriously beautiful day and there seemed to be quite a few tourists in town. I got down there later than I would have liked to, but needed sleep and had to stop by the gallery to frame and wire my Nocturne painting. I drove around and around and around and all of the lots and garages were full. Finally I found a garage that had empty spots and was open 24 hours. This was a factor since I wasn't sure how long I was going to be down there. Some of the "commuter lots" shut down at 6 or 7. There was a block party- Art on the Avenue- where the day's paintings would be judged and that was at 5:30. I was so drained from driving around and looking for parking and then trying to scout a place to paint. I found a dive-y looking bar called Stan and Joe's Saloon and went in for a beer and a bite and to try to make friends with a bartender so I would have a place to use the restroom if need be. I had noticed a liquor store across the street that I thought would be interesting to paint so I talked with the bartender about where she thought would be a good place to set up. The sidewalk was narrower here, or at least seemed so. Maybe it was just a little bit more trafficked in the day-time. She was very helpful and told me that she would like to see my painting when I was done. I ended up setting up in what I imagined was a little smoker's nook between the entrance to Ram's Head and Café Olé. Thank you so much to owner Claudia Hassan for snapping some pictures of me in the act! Now I was really under pressure because I calculated how long it was going to take me to break down my set-up, frame my painting, and take it over to Maryland Avenue where Art on the Avenue (the block party) was happening. I guessed I'd have to stop around 4:45 to make it by 5:30 and that was cutting it close! I finally started painting around 1:30 which did not give me much time at all. Well, I painted fast and furious and did the best I could. I wasn't totally happy with my composition but with such limited time I couldn't wipe anything out and re-paint. A timer I had set in my phone went off at 4:45. I stopped painting, hurriedly packed up all of my supplies and ran my painting up to the 3rd floor of the parking garage. I ran back down for my bags which the friendly bartender had let me stow inside the bar while I ran with the wet painting and palette. My heart was pounding and I was sticky with sweat as I got to the top of the parking garage with all of my stuff. I chugged hot water that had been sitting on the passenger seat boiling all day in the hot summer sun. It was basically the opposite of thirst-quenching. Why did I leave it in the car and not take it with me? Who knows? Framing a wet painting in the trunk of your car is not something I would recommend, but it was inevitable. It is more or less a recipe for how to get wet paint all over yourself and your car and anything else that happens to be around. I found these really great inexpensive open-back frames at Artist and Craftsmen Supply but they unfortunately didn't have any clips or a way to hold the painting in the frame so I had to hammer wire brads into the edges. It was so awkward and frustrating and it is a miracle that I didn't damage the surface of the painting beyond getting some dirt and grit on it. Finally the painting was wired and ready to be taken to the block party. I was overheated and sweaty and vaguely delirious. I grabbed my easel and practically ran over there. I couldn't quite remember exactly how far it was and I didn't want to be late. What, pray tell, can make a stressful situation even more so? Shakespearean period street performers. My nerves were frazzled as I tried my best to tune them out. I set out to find a representative from the MFA (Maryland Federation of Art- the organizers) to try to figure out where to go and what to do. The woman that I found was the Executive Director (she happened to be the first person that I saw with an MFA t-shirt on). I had seen her earlier that afternoon to drop off my Nocturne for jurying and display so she recognized me as I approached her. "Oh hey, guess what? Your painting sold!" she said. Huh? What? I was flabbergasted! "Yeah, to me!" she said. Oh my goodness. I was so emotional. It had been such a rough day and that was about the greatest news in the world! I thanked her profusely and she directed me on where and how to set up for the judging. I took a look at all of the other artists' pieces and they were all really, really good. There were a few that were outstanding. I felt good about my piece. I wasn't expecting it to win a prize but of course I was hoping that it was. It ended up not but I was totally ok with it. There was some stiff competition. Congratulations to the winners! I ultimately had fun and learned a lot. I left still feeling accomplished and like I want to continue to paint plein air. I went home to Baltimore, tired and hungry. I picked up my husband Sean and headed to the local watering hole for a drink and some food. A friend of mine was there and had seen the painting that I had done earlier that day and posted on Instagram and he told me that he wanted to buy it. (Thanks, Greg!) I am so glad to have people like him in my life who want to support what I do so I can continue to do it. Thanks so much to everyone from Maryland Federation of Art that helped to put on a wonderful event. I can't reiterate enough that it was such a great learning experience that I highly recommend to anyone starting out in plein air. And also a huge thank you to everyone that continues to buy my paintings and prints, hang out with me at the gallery, read my blog posts and support me in all kinds of different ways. It means the world. Follow @bettypaints on Instagram for even more art!